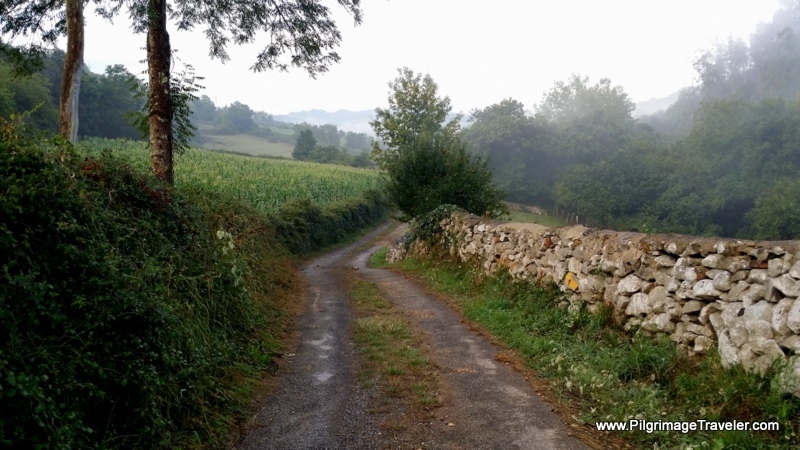 On day two of our camino primitivo the challenge was about the juxtaposition of beauty and pain. 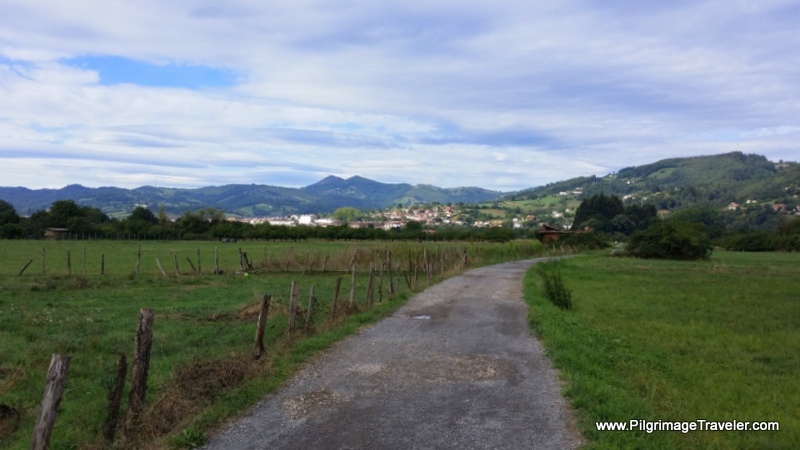 Despite our perception of fitness, coming from the mountains of Colorado, nothing prepared us for day two on the camino primitivo and what the pavement pounding would do to our bodies. While I was worried about our aging knees, it seemed that our wearing of elastic knee supports did nothing for the foot pain and shin splints that we both felt immediately upon embarking on our second days journey! This pain was to plague us all day. 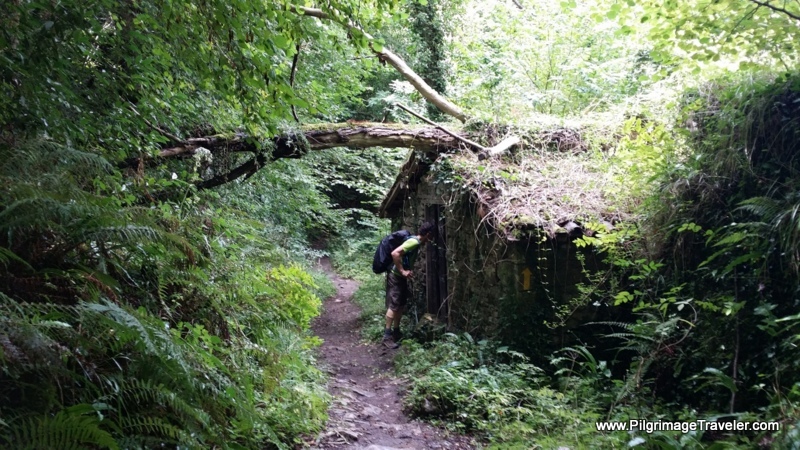 The Primitive Way on day two was beautiful and our original goal was to get to the albergue in Cornellana. But as Caminos go, we were redirected and stayed in La Doriga instead. Here are the GPS tracks for the distance that we completed on day two. We did not make it to San Juan de Villapañada on Day One, because we also walked to the Naranco World Heritage churches that first day. 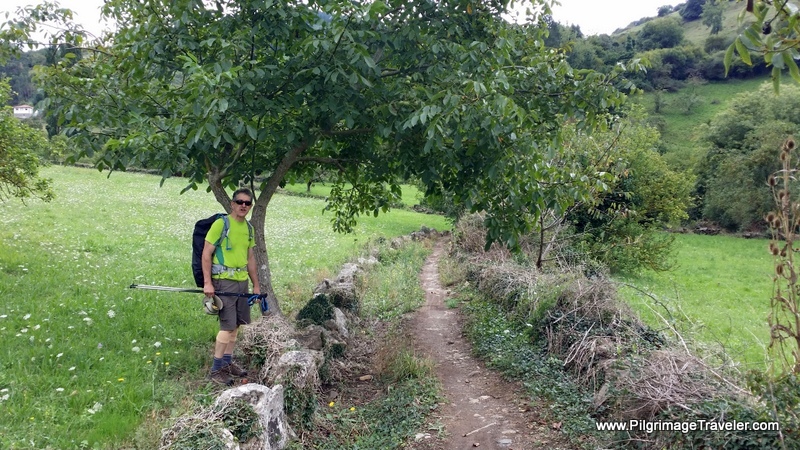 This turned out to be fortuitous for two reasons: because of our developing physical pain on day two of the Camino Primitivo and because as you can see below, the climb to San Juan de Villapañada is quite strenuous for the end of a very long first day! The elevation profile for our day, starts halfway through the traditional stage, at Escamplero, shown in the first elevation map below. There is significant elevation change in this section, of about 200 meters (650 feet), first down, then climbing back up, with a 60 meter (200 feet) bump in the middle to Premoño, just after Escamplero. We completed the second stage, only to La Doriga, about 5.2 kilometers onward from the turnoff to the albergue in San Juan Villapañada, 2.0 kilometers before Fresno, shown in the second elevation map below. 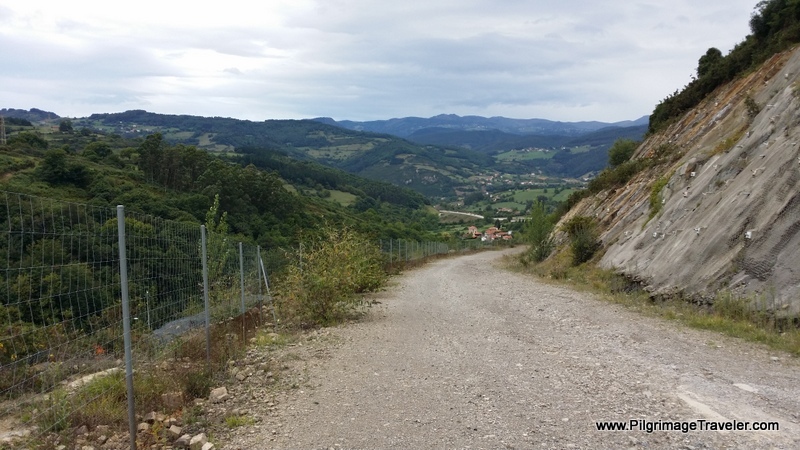 This section included a 125 meter (400 feet) climb from Grado to Alto del Fresno, before descending 230 meters (750 feet) into La Doriga, 2.7 km before Cornellana. 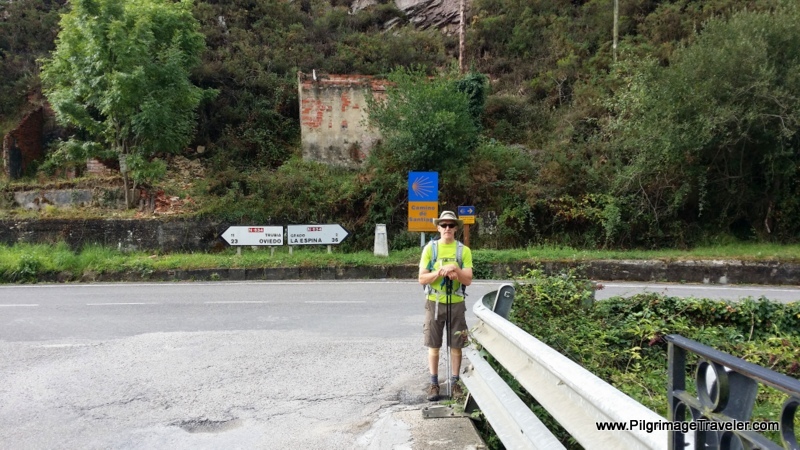 We could have easily descended 2.7 more kilometers to Cornellana on this day, but we do not regret our choice of the wonderful little albergue, the Cá Pacita in La Doriga. See father below for photos and description of it. As we left the municipal albergue in Escamplero, we timed our departure perfectly, for viewing the sunrise. The air was fresh on this August, mountain morning, and the sky was aglow with the dawn-light (around 7:30 a.m). After the magnificent sunrise and moment-capturing through the lens of our camera, we began the long descent toward Premoño. 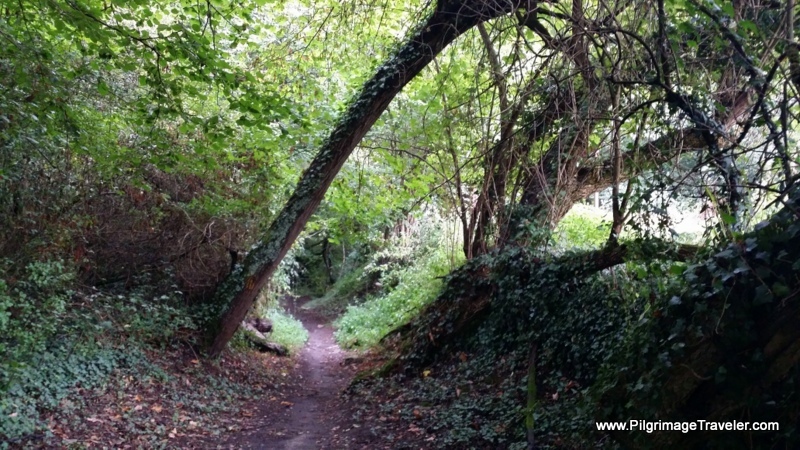 We soon discovered that the long downhills, while easy on the lungs, killed our lower legs. While we knew this from hiking many, many mountains in Colorado, doing it on pavement, was indeed another story! Our bodies were just not prepared for the pounding on the pavement. 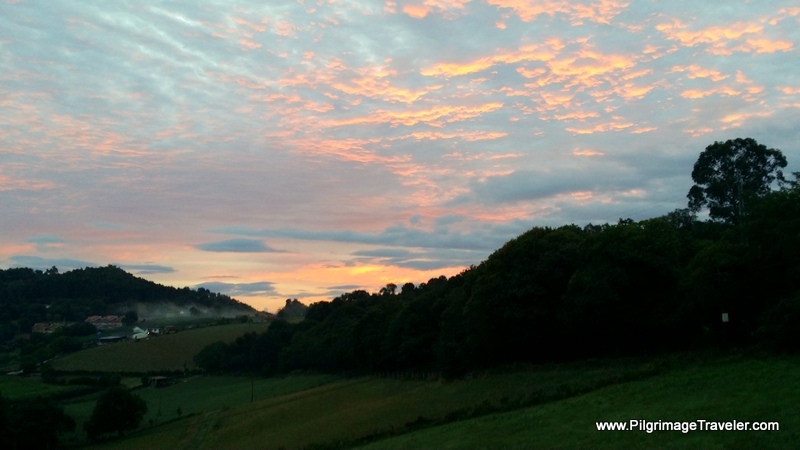 Thank God the scenery was beautiful, the morning fresh with mist but no rain and the sunrise fantastic! I breathed deeply and focused my intention on gratefulness that I could feel this pain! It could be much worse - I could be handicapped and unable to have this experience! I felt alive and well! As we descended downhill on the pavement, I focused on using my poles as much as I could to take my weight off my lower legs. I noticed that the balls of my feet, just below my toe pads really started to hurt on this stretch as well. My right foot hurt worse than my left. Somehow I must have been striking harder on the pavement with my right foot. I tried to intentionally lighten my right foot strike. 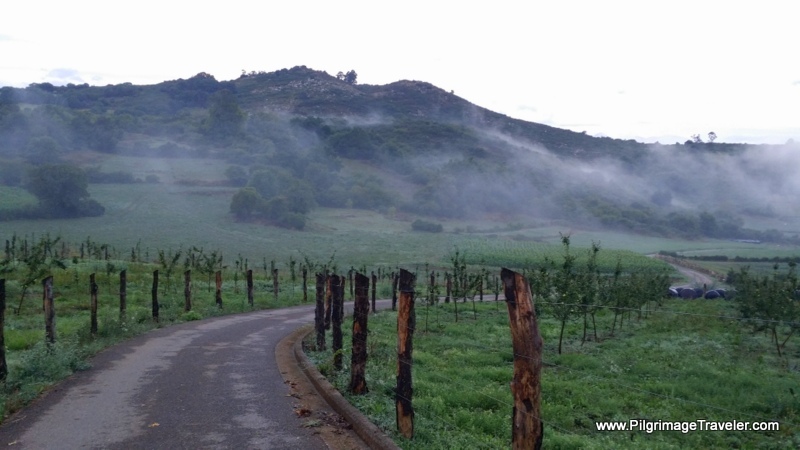 The morning freshness and the mist that hung low in the valleys was enchanting. This stone wall, below, that bore a waymark caught my eye, as the misty mountains framed the background. 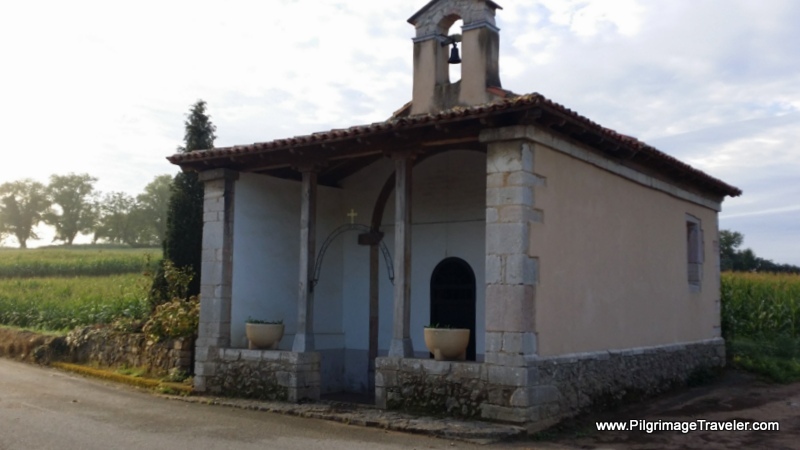 Shortly into this day two of our Camino Primitivo, about one kilometer after the albergue in Escamplero, along the AS-234, we came upon a small pilgrim chapel, the Capilla de Fátima, pictured below. We stopped for a short while to look at the chapel. Unfortunately, it was locked. 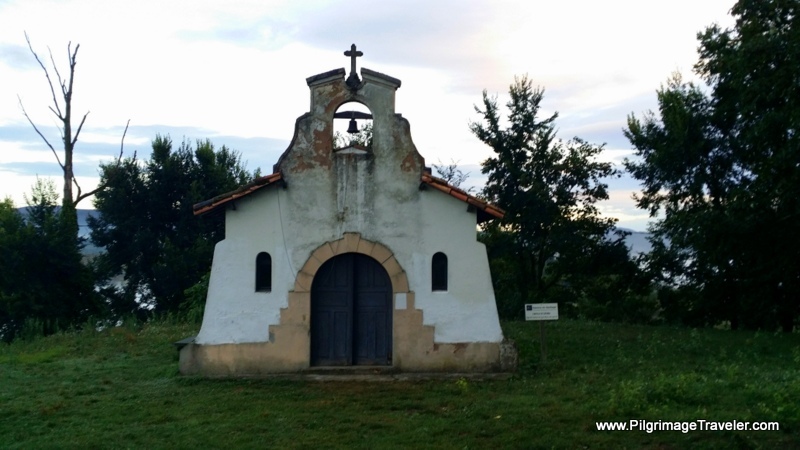 I had set an intention, that every little chapel that I would come across on my Camino, that I would stop, and at a minimum, say a little prayer of gratitude, for my journey, and all that was available to me. And then, a sweet turn took us onto a semi-paved lane and sweet relief for my aching feet and shins! The glorious blackberries were everywhere, lining the path, also a welcome relief to our aching stomachs that had not yet had any breakfast. Deeper into the countryside we went. Here Rich is harvesting our berry breakfast. 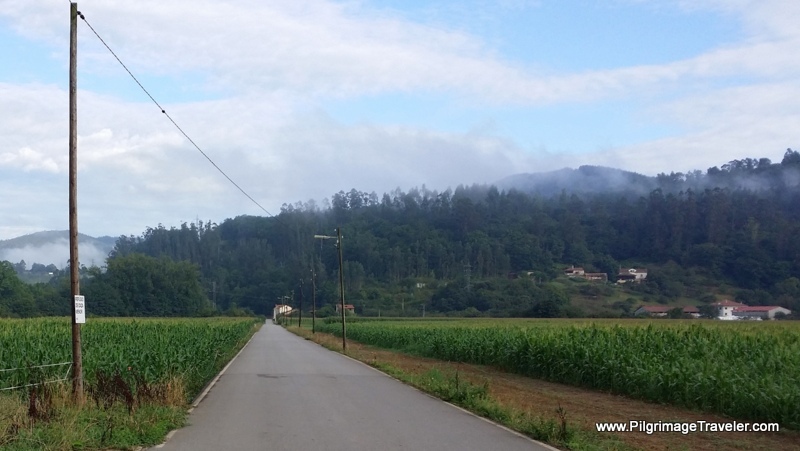 Our country lane soon re-joined a paved road, as it climbed into Premoño. The uphill portion gave our sore shins, a needed break from the downhill pounding. The uphill was most definitely easier on the shin pounding! 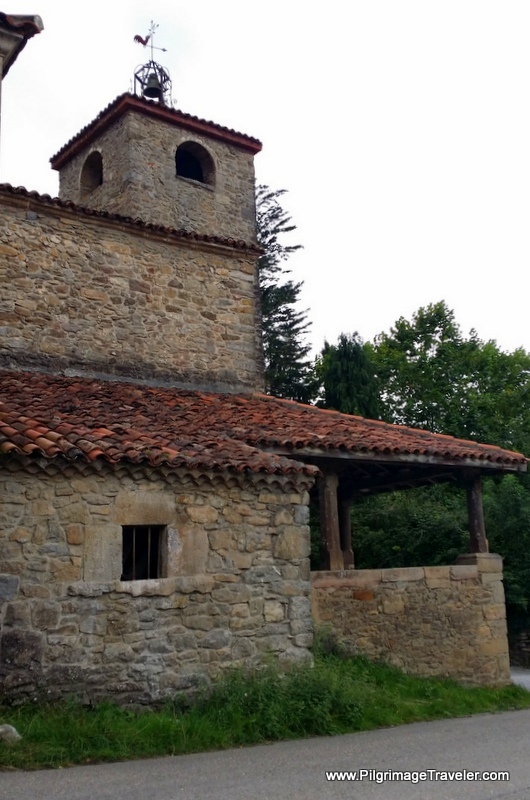 In the heart of the hamlet, the Capilla of Santa Ana de Premoño greeted us. Once again, we stopped and filled our hearts with gratitude. 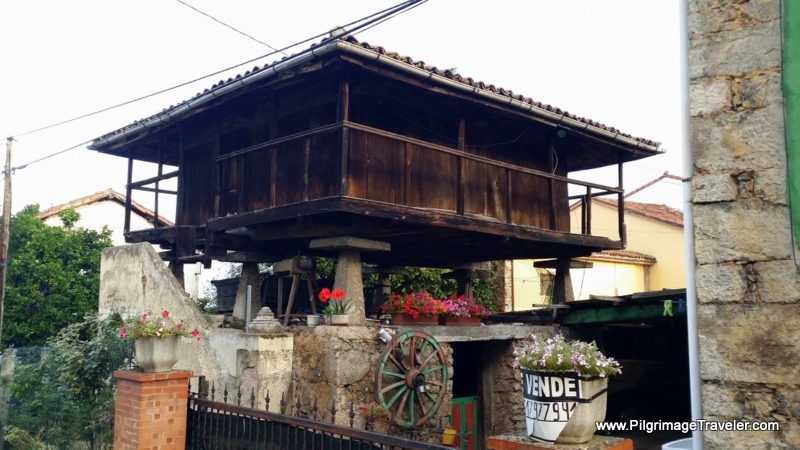 A beautiful, raised horreo, or granary in Premoño. The Primitive Way after Premoño turns again into a path for a very short section, just before Valduno. 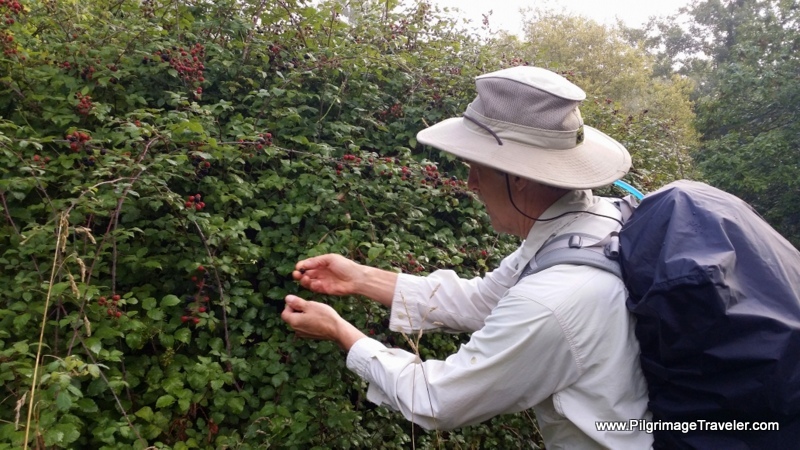 It leads you into an entanglement of wild blackberries, which we continued to receive as our gift on the Camino! It was a full 5.4 km before we found the first open café bar for breakfast, about an hour-and-a-half's journey! 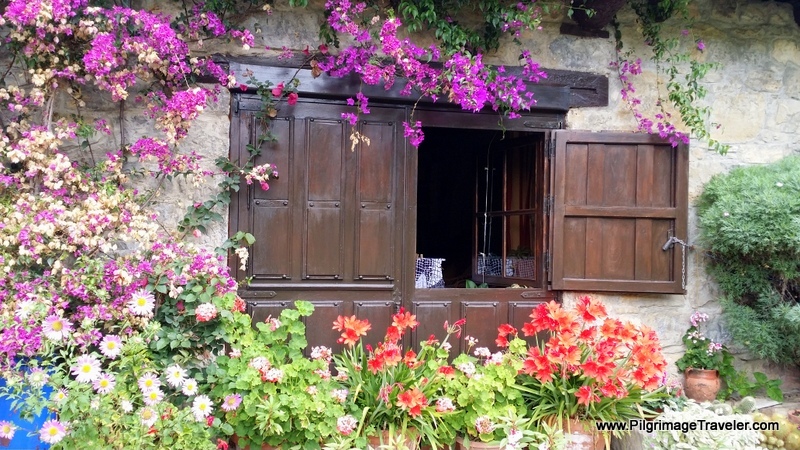 As we walked down the hill into Valduno, the Bar-Tienda Casa Dylsia warmly greeted us. Our guide said the bar opened at 8:30 am, but it was going on 9:00 a.m. when we arrived and it was still not open! A word to the wise ~ never count on anything being open when it says it will be! However, today we were lucky. We managed to see some movement inside and within 10 minutes the bar opened as more pilgrims gathered outside, waiting to get in! 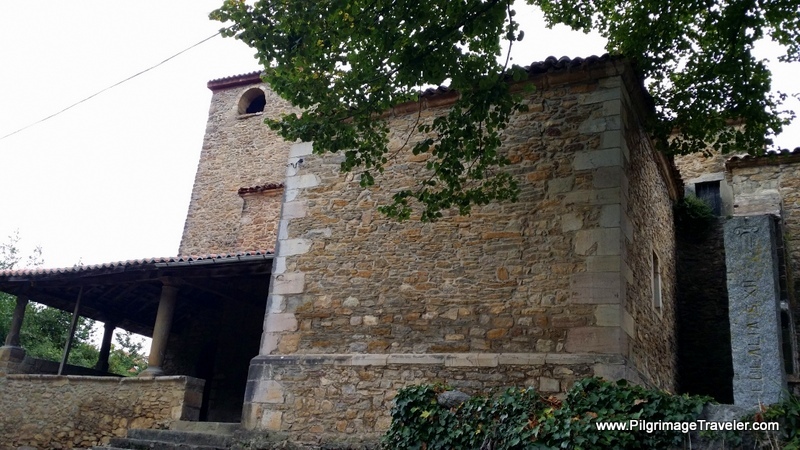 In the town of Valduna, and just a kilometer or so off the Camino Primitivo is the Termas Romans, or Roman baths. We took the side trip, but it wasn't really worth it, as a church had been built over the ruins of the bath and all that is left is the foundation walls. 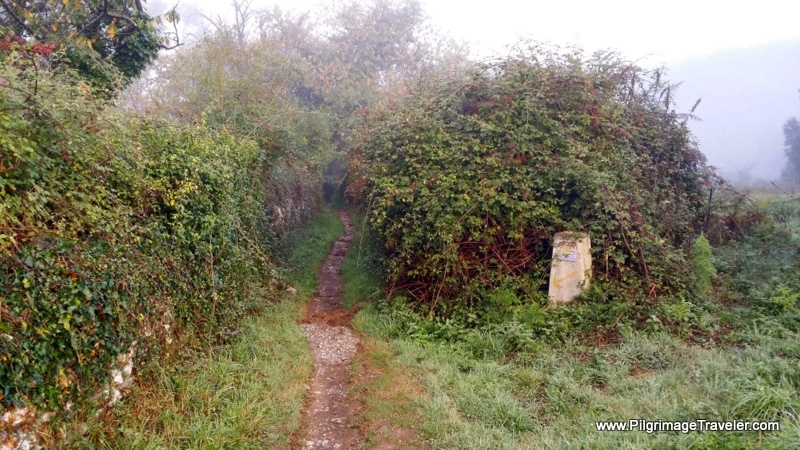 We soon were back on the The Primitive Way and walking toward the next town of Paladín, on this shortcut, shown below. 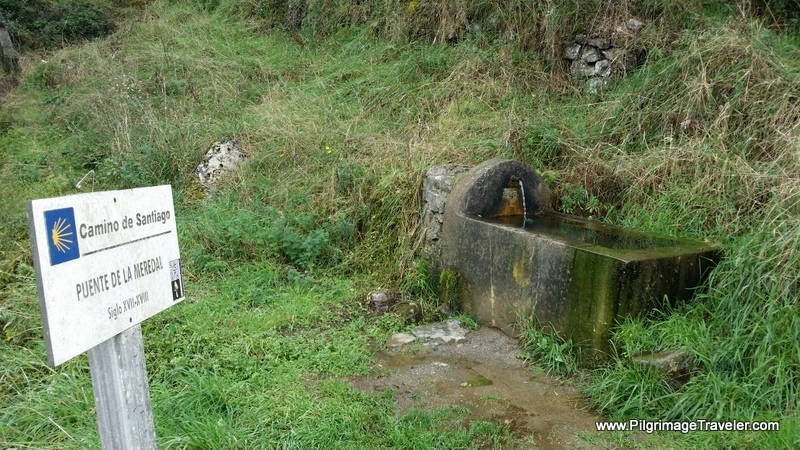 It was on day two on the Camino Primitivo that I really began to notice a sore throat that I thought was merely a passing nuisance from insufficient hydration during our long-flight the day prior. Until now, I hadn't paid much attention to the thickness and dryness that was developing in my throat. I kept walking, and soon we were in Paladín. Beyond Paladín the Primitive Way briefly turns into another sweet path. 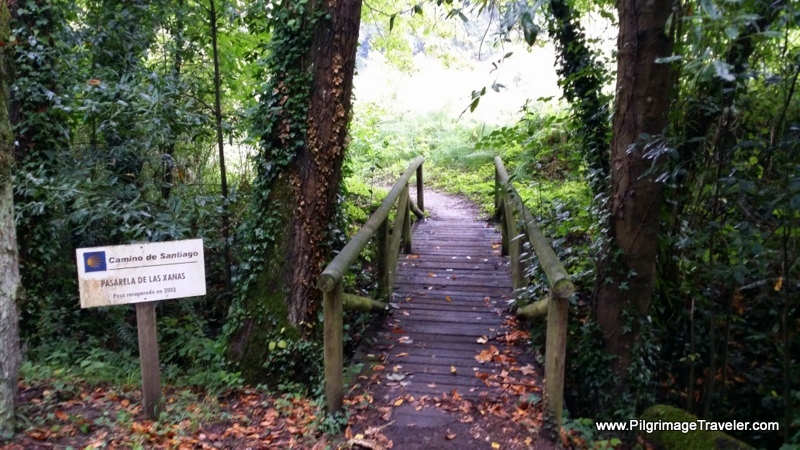 Asturias has invested in some Camino infrastructure, as you can see in this lovely foot bridge and all the signs placed along the way. Back on the AS-234, coming into Peñaflor, crossing the River Nalón, Rich posed on the historic Romanesque bridge over the river. Apparently this was a site of several Peninsular War battles. Looking back on the bridge, with me in the shot! It is a dramatic place, the rock wall and the river gorge. 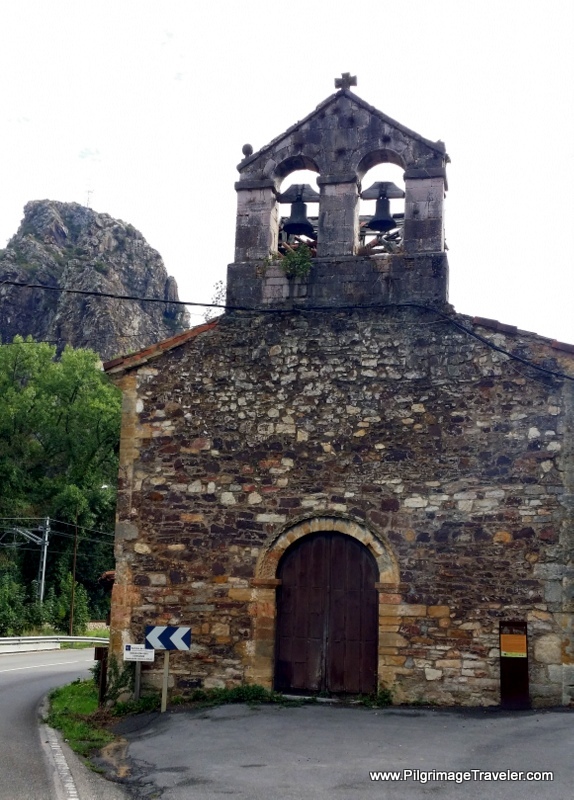 After crossing the bridge at Puente de Peñaflor, this lovely little stone country church greets you, the Iglesia de San Juan de Peñaflor. 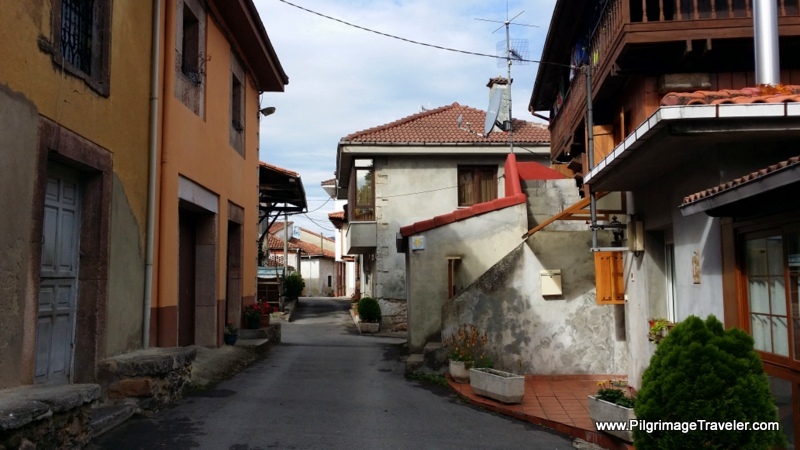 The town proper, of Peñaflor, is a lovely little town, so historic and quaint as are many Asturian towns. 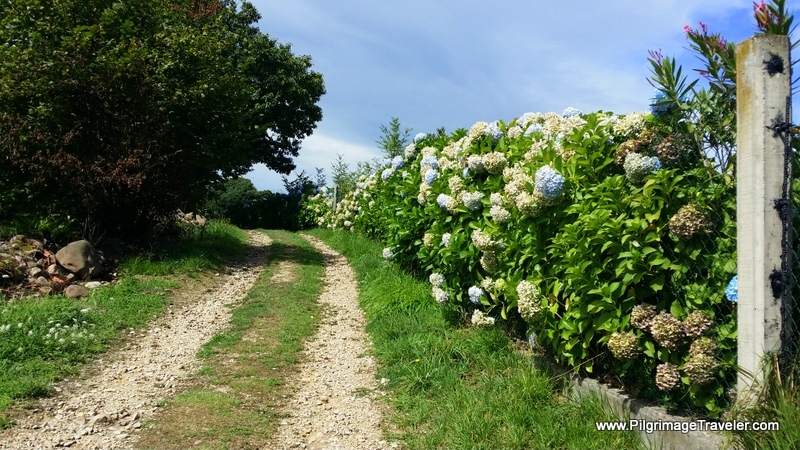 After leaving Peñaflor, a long, flat, paved path leads the pilgrim onward to Grado. It is Grado that you see in the distance in the photo below. 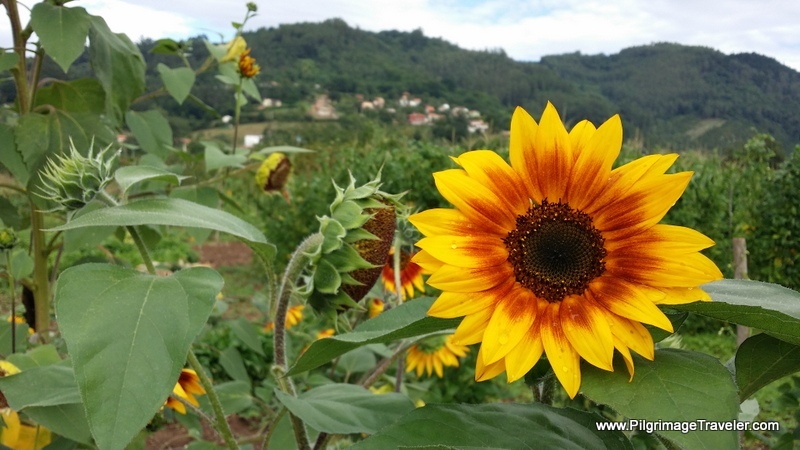 On the way to Grado, we passed a field of sunflowers. How delightful they were as they greeted us with their sunny faces! 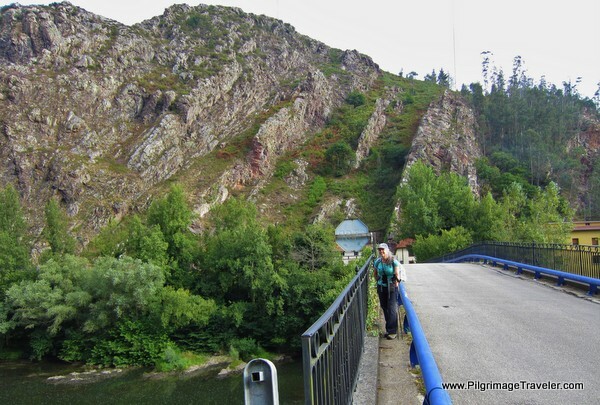 The Primitive Way joins the main road, the N-634, at the bridge, shown below, and goes through the town of Grado, on day two of the Camino Primitivo. It is a lot of uphill pavement walking through town on the N-634, which is not the most pleasant. 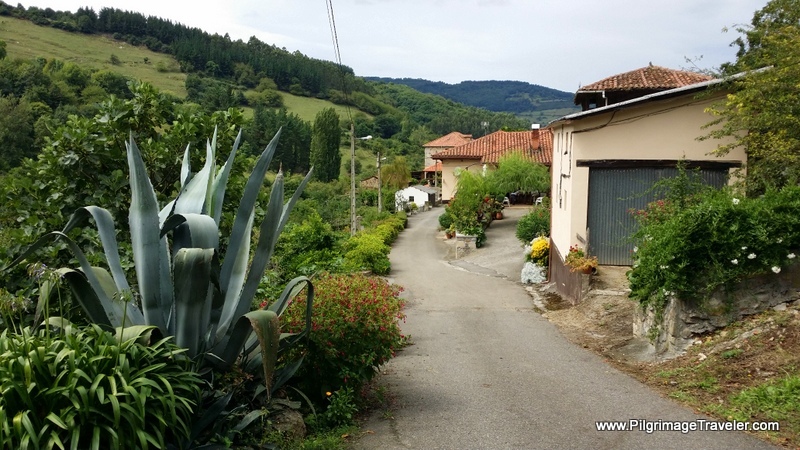 In about 400 meters from crossing the river Cubia at the bridge, and after passing a city park on your right, you will see the turnoff to the right, for the Albergue de Peregrinos de Grado. It is another 150 meters up the hill to the 2-story, stone building that houses the albergue (not shown). 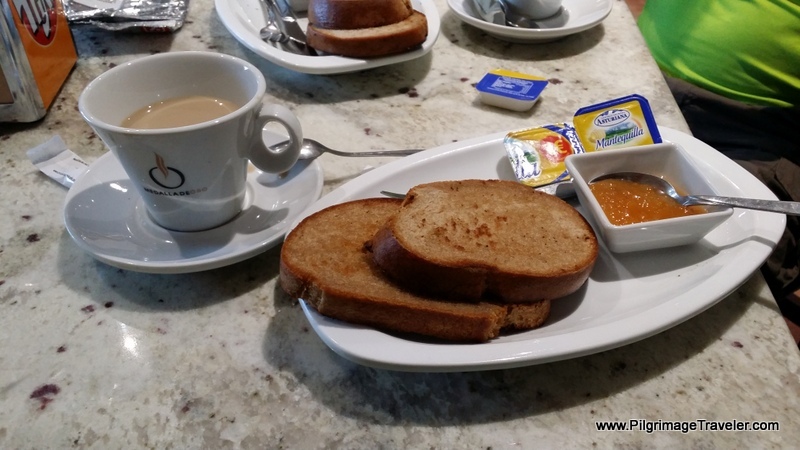 We thought we would take advantage of the route through town and stop for another café con leche and a bite to eat. We found a place called the Auto Bar on the far side of town. 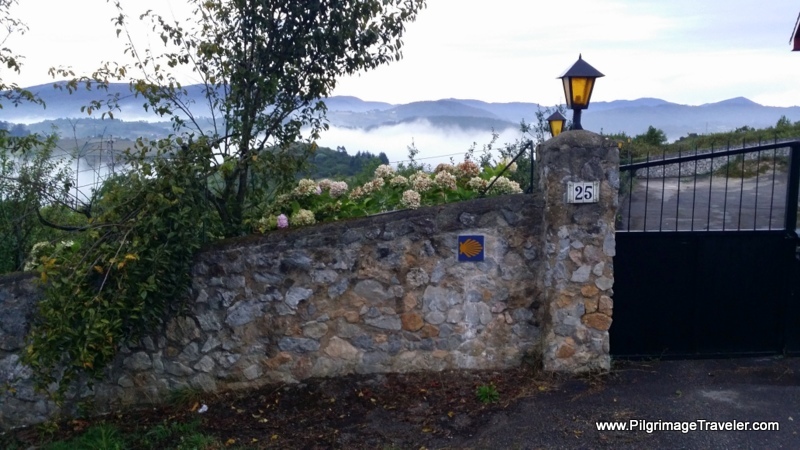 It is also a family run hotel, so if you wish to conclude your day here, this hotel is right along the Camino at the far western side of town. 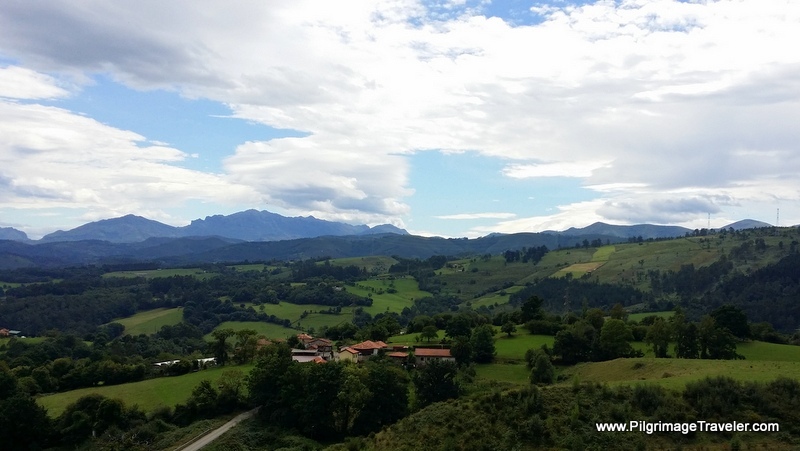 In the bar, we met a pilgrim in flowing black robes, doing the Primitive Way backwards towards Oviedo. After a long and interesting conversation with him and lots of advice, we determined that the best option for the night was in a friendly place he recommended in Doriga. Apparently the convent in Cornellana was under construction, and he preferred the small boutique cabin that the albergue offered in Doriga (see farther below), which is where we actually stayed. 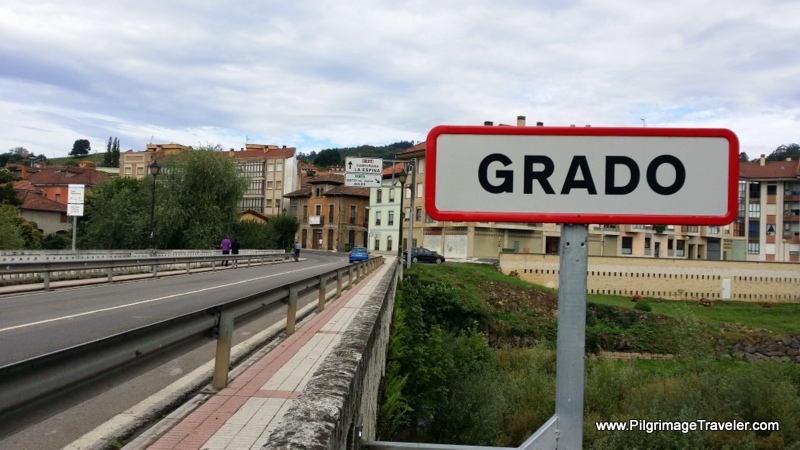 If you decide to stop in Grado, and the albergue is full, here is a link for hotels. 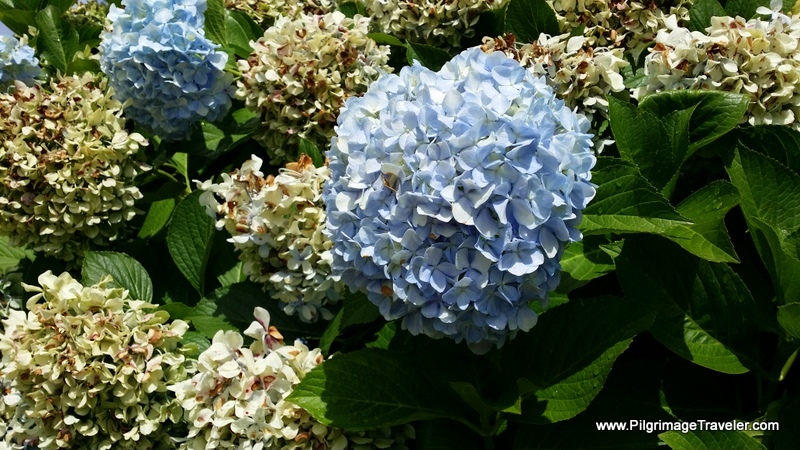 On day two of the Camino Primitivo, it once again leaves the pavement behind and turns into beautiful lanes lined with monster hydrangeas! This is on the Primitive Way shortly after leaving Grado on a named road called the Calle la Podada de Arriba. 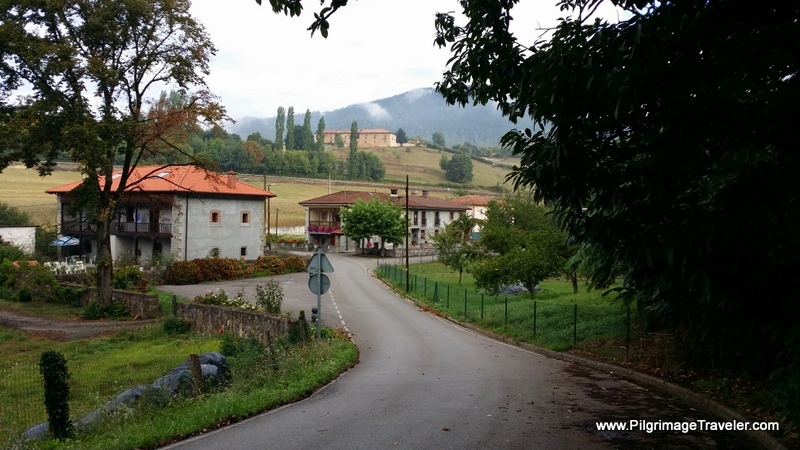 After the country road the long up-hill climb joins paved roads, upwards toward the turnoff for the Albergue de Peregrinos de San Juan de Villapañada. While somewhat strenuous, the views all around are to die for. We did even more climbing, below, towards San Juan de Villapañada and the crest of the hill. This would be a long climb at the end of your day one, if you chose to come all the way from Oviedo to here. 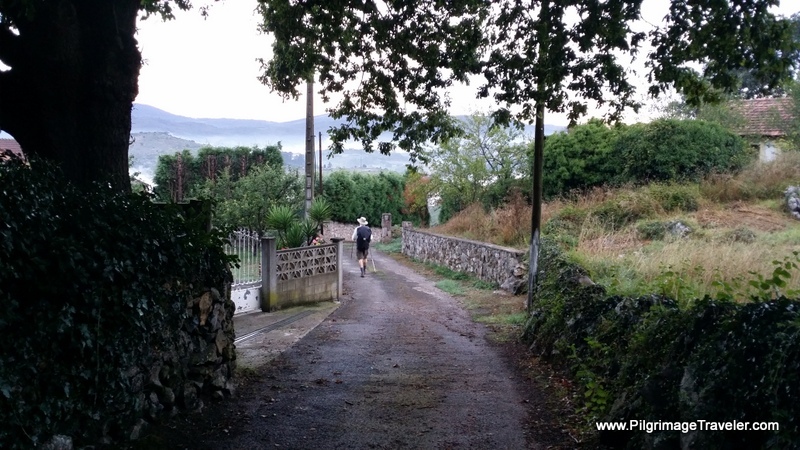 In addition, the albergue is almost a full kilometer off-Camino. Watch for the signs. The Tinkle of Cow Bells is Everywhere! While the Primitive Way follows the A-63 highway, on its north side after leaving Grado, one only catches a glimpse of it here and there. 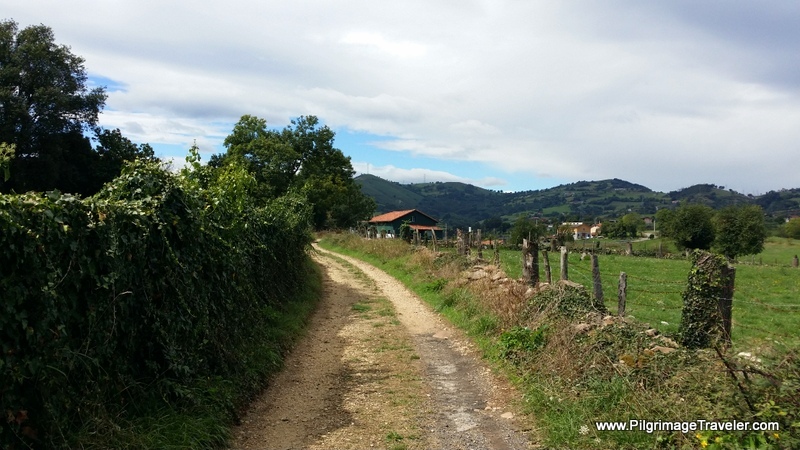 The highway becomes apparent at the crest of the long hill, shortly after the turnoff to San Juan de Villapañada on day two of the Camino Primitivo. The turnoff is clearly marked. 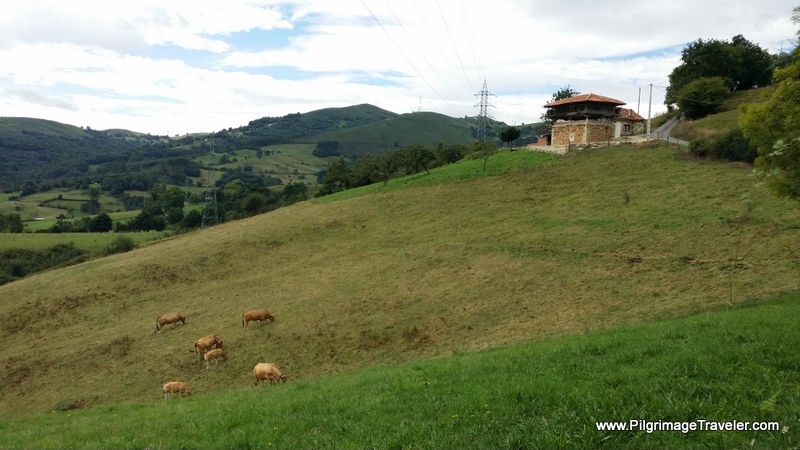 The albergue is about 850 meters off-Camino, to the north (see my Google map above). Here is where you turn left onto a long gravel road. This road, shown below follows an ugly power line as it drops dramatically into the town of San Marcelo just after crossing the highway. Near the bottom of the hill when the road makes a bend, we came upon this fountain (fuente) at the Puente de la Meredal. We did not drink from here, as our hydration packs were still sufficiently full. The town of San Marcelo is a charming one and a delightful gentleman greeted us with a hand-full of lemons from his tree, to share. 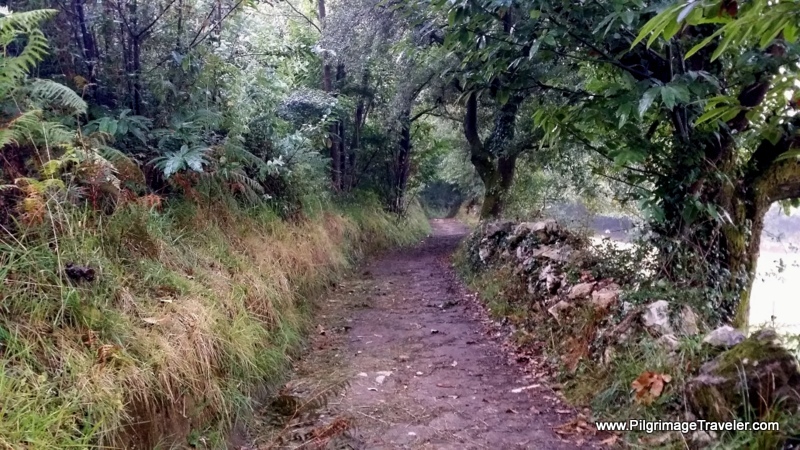 After San Marcelo, the way, on day two of the Camino Primitivo, veers onto this lovely path, with rock and hedge-lined walls. 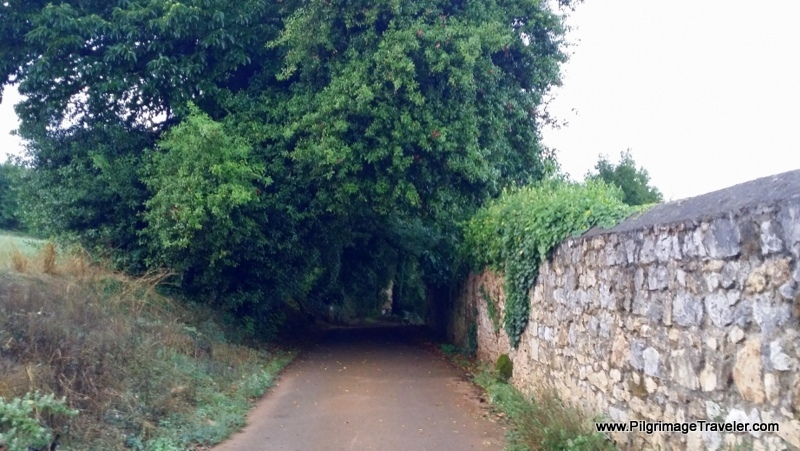 The path comes out of the woods, and into a small hamlet where the Santa Eulalia church, built in the XII century greets you on your way into town. The Camino goes right around this church, to the front and into the town. You have arrived in the hamlet of Doriga. The stone pillar to the right of the church, in the photo, above, identifies the church. 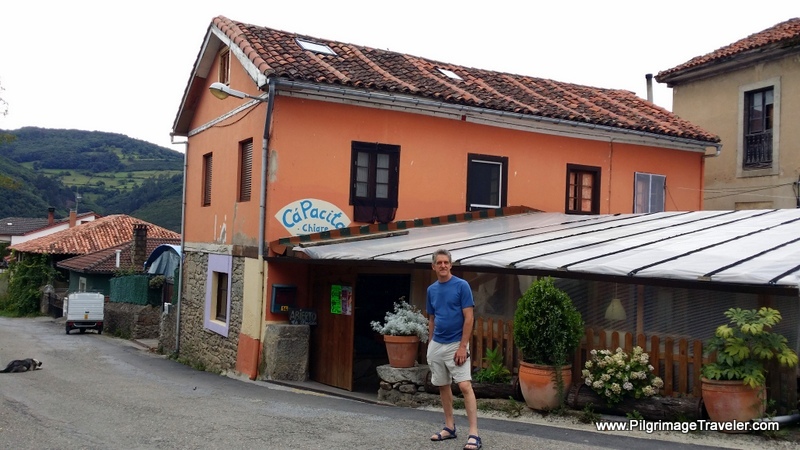 Right across from the Santa Eulalia church is the Cá Pacita, the restaurant and albergue, our final stop on day two of our Camino Primitivo. 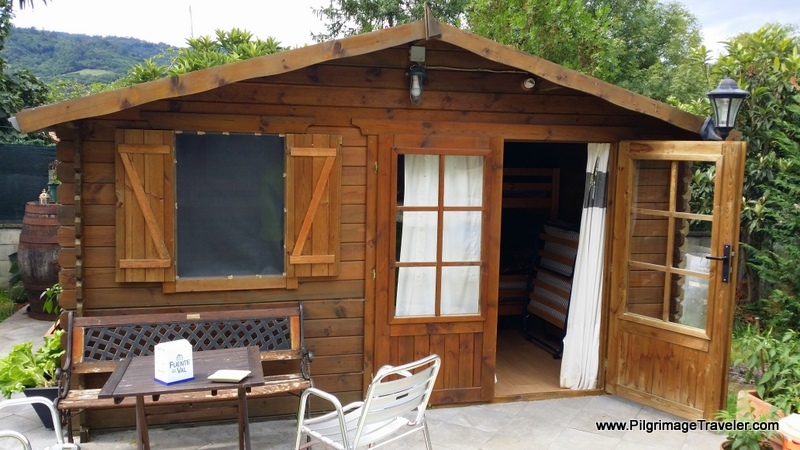 The little cabin guest house behind the restaurant that sleeps six was very quaint and cozy. It was a good call from the robed pilgrim. We ended up enjoying the place all by ourselves that night! Apparently all the other pilgrims we met the night before had gone on to Cornellana. Tired and famished, we arrived in time to partake in the Sunday "lunch" hour. The restaurant was packed with Spaniards in their best dress, celebrating some occasion, of which I was not sure. 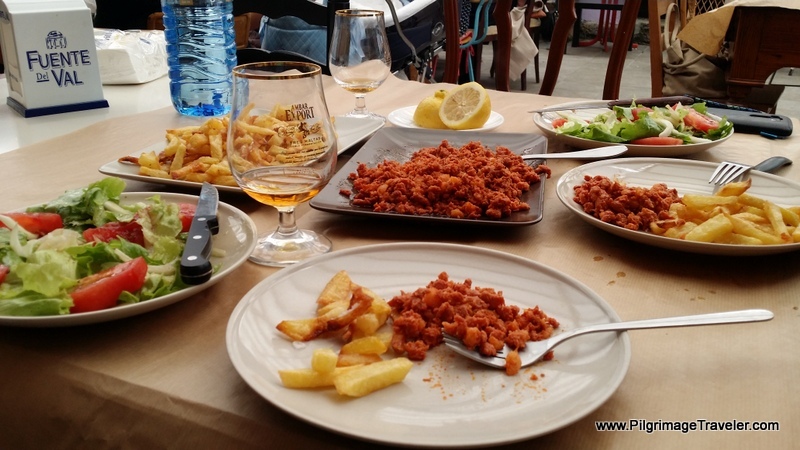 Our meal consisted of a starter of Crema de Calabasín (Cream of Squash Soup), followed by a delicious dish of spicy, fried pork pieces called picadillos. That night while lying in my bed, I stretched the heck out of the entire front of my legs and hips. I did the Eye of the Needle and the Half Saddle poses, to open and relieve my shin splints. Ouch, they hurt! Since there were no other pilgrims to talk to at our albergue, it was my husband, also suffering from shin splints, with whom I commiserated! He was a good co-commiserator. I popped Ibuprofen for both my shin splints and my sore throat, which didn't seem to abate all that much as the day progressed. 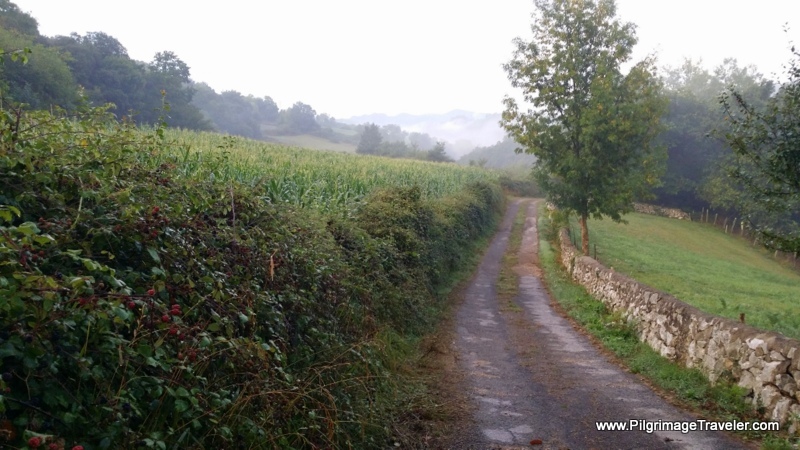 May you find the spirit of community on your own day two on the Camino Primitivo! May the experience take you to the in-between places, where normal and surreal collide!